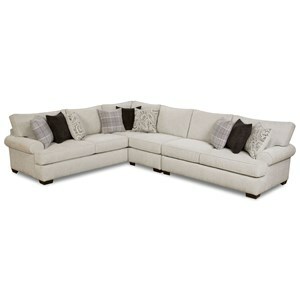 Create a fresh and modern seating area with this contemporary sectional sofa. Complete with six individual pieces, this sofa includes a right arm facing chaise that offers a perfect spot for lounging. The attached tufted back of each piece and exposed wood block feet play into contemporary aesthetics. Arrange the sectional to your liking and then bask in the comfort and style of this living room necessity. The Tate Contemporary Sectional Sofa with Right Arm Facing Chaise and Tufted Back by Jonathan Louis at Thornton Furniture in the Bowling Green, Alvaton, Glasgow, Scottsville, Franklin area. Product availability may vary. Contact us for the most current availability on this product. 394-15 Contemporary Sectional Corner Piece with Tufted Back 2 37" 37" 31"
394-10 Contemporary Sectional Piece with Tufted Back 3 34" 37" 31"
394-82R Contemporary Right Arm Facing Chaise with Track Arm 1 37" 62" 31"
Browse other items in the Tate collection from Thornton Furniture in the Bowling Green, Alvaton, Glasgow, Scottsville, Franklin area.